Devon based therapist, Nikki Baker MAR, introduces this popular therapy and explains what to expect when you have a Reflexology treatment. Thinking about visiting a Reflexologist? You may need to manage your stress levels better – perhaps for the sake of your health. You may want to try a holistic approach to raise your energy levels, reduce pain, improve sleep or tackle a specific health problem. You may be feeling overstretched, run down, or coping with difficult circumstances. Reflexology? That’s feet, isn’t it? Yes! A Reflexologist works reflexes on the feet which relate to the rest of the body. So what might simply have been a lovely relaxing foot massage, becomes a treatment for the whole body and mind. 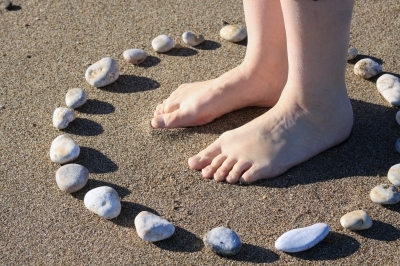 Reflexology approaches health and wellbeing by looking at the person as a whole, and seeking to create the optimum conditions for the body to repair, re-balance and heal. Before you begin, your Reflexologist will ask you some questions about your health and invite you to talk about what prompted you to book the treatment. Then it will be time to take off shoes and socks and get settled in a comfortable reclining chair. The therapist will adjust your treatment to support you in whichever way you need. So they might focus on reflexes to reduce pain, promote hormone balance, improve digestion… whatever you need on the day. Some people worry that they might be ticklish, but in fact you will find that the treatment is deeply relaxing and you may even fall asleep – which is absolutely fine! You may well feel quite different to when you arrived. Deep relaxation shifts us into new thinking patterns, and you may feel very calm and peaceful. People often sleep very well after Reflexology! And as your body shifts into its mode of Rest and Repair, hopefully you’ll begin to feel better all round. If you’d like to find out what Reflexology can do for you, why not give it a try. I offer home visits across the Mid Devon area, so drop me an email, letting me know a little bit about you and roughly where you live, and we’ll organise an appointment. I look forward to working with you. I like to get out and about! Home visits are available throughout Mid Devon, including Crediton, Silverton, Cheriton Fitzpaine, Witheridge, Cowley, Tedburn, Bow, Morchard Bishop… and everywhere in between!